Breastfeeding Harlow has been a great bonding journey so far and as you know any handy products out their to help aid breastfeeding is right up my street. With Harlow getting bigger she's developed quite the little grip and when I breastfeed her she likes to pinch at my skin, grab my hair or grab my top and flash me to the world, so when Mama Jewels got in touch to see if I'd like to review one of their nursing necklaces I happily agreed. I completely understand how Amanda must have felt not being able to wear her lovely jewellery. I get frustrated at times and not just because the jewellery could get broken or damaged but because I have some rings, watches and necklaces that could potentially scratch Harlow due to their size and jagged edges. It's lucky for us Mummy's then that Amanda created the very stylish Mama Jewels. Mama Jewels were kind enough to let me choose the necklace I wanted to review so I had a nosy on their website and boy was it a hard choice. 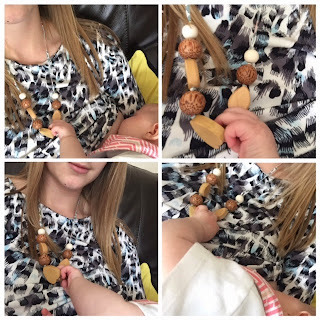 There's so many lovely necklaces to choose from but in the end I went with the Liberty print Betsy teal wooden teething necklace because I liked the look plus I thought it would go with a lot of the tops I currently wear. 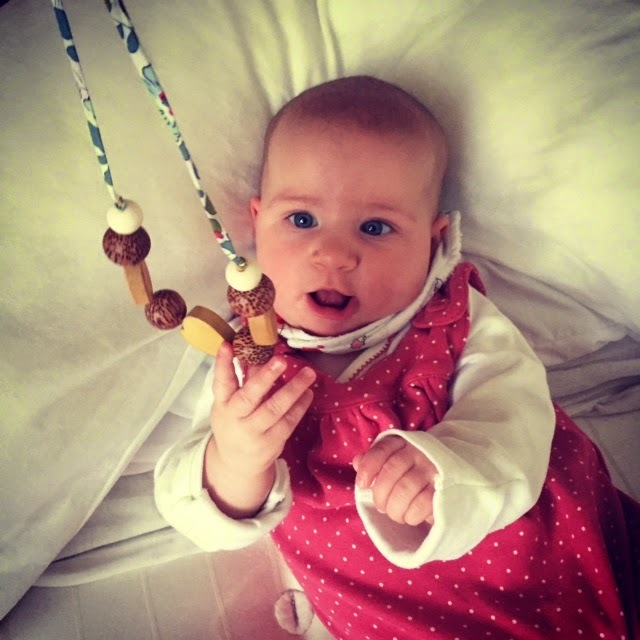 The Liberty print Betsy teal wooden teething necklace is handcrafted and as the name would suggest it's ethically made in England using fabric from Liberty's in London. 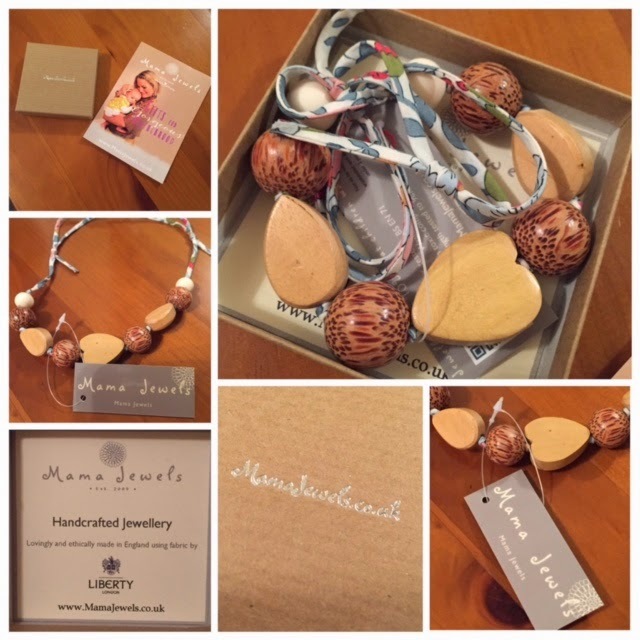 Having visited Liberty's a good few times and looked in awe at their amazing fabrics I couldn't wait to get my hands on this necklace and I wasn't disappointed. The fabric is lovely and soft with a few different shaped wooden beads arranged and knotted so they don't move around. The necklace is a slip knot so very easy to put on and take off as well as easy to adjust to your preferred length. I tend to wear it short when not breastfeeding and then just pull it long when Harlow needs fed so she can play with the beads and not my skin, hair or top. It works really well and the great things is I don't have to worry about her hurting herself on this necklace or it being broken. She's had a good old pull and even a little nibble on it and so far it's survived with no damage, she doesn't have any teeth yet mind you so hopefully it'll survive when the teeth come in. I didn't realise that this necklace could be washed so I was pleasantly surprised to see on the info card when it arrived that yes indeed you can stick this in the washing machine! How fab is that, especially after a dribbly baby has been chomping on it. This particular necklace is priced at £17.95 which is very reasonable but there's lots of other necklaces on the website to suit different styles and price ranges. 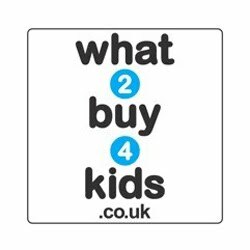 There's some even as cheap as £9.00 which are in the sale at the moment so why not grab a bargain! 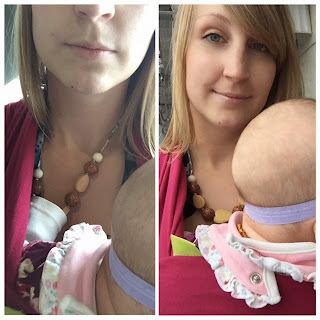 Overall a great product and perfect for any Mums out there breastfeeding or otherwise. The necklaces are reasonably priced and you could definitely buy a few to go with different outfits as there's so much choice. You can even have certain pieces of Mama Jewels personalised and if you're pregnant Mama Jewels stock some lovely sterling silver Mexican bola chimes. Also if you're looking for a new baby gift then there's even some gift hampers which look adorable. Wish I had received one of these when I had Harlow. Please visit www.mamajewels.co.uk for more products and information. You can also see what they get up to on Facebook and Twitter so why not pop over and say hello. I was sent the Liberty print Betsy teal wooden teething necklace in return for an honest review. All opinions are my own. 0 comments on "Review: Mama Jewels Necklace"